2017 was a year I will never forget, and one that will set the bar for the future! I was able to travel and see so much, make friendships and bonds, and experience some incredible things! Here is a rundown of some of my favorite images of 2017, complete with the memories made! 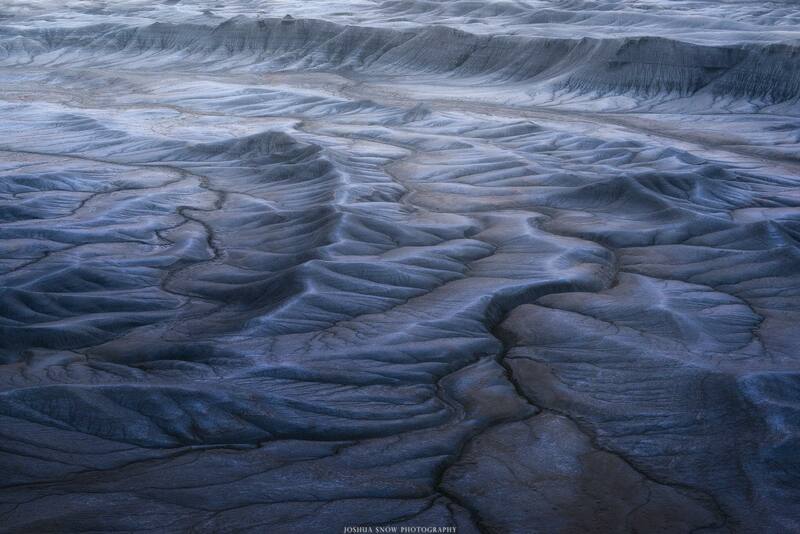 Taken during a sunrise in Death Valley while scouting with my good friends Jesse and Duane. Jesse knows Death Valley like the back of his hand, he told us how to get here the night before since he wouldn’t be in until late. 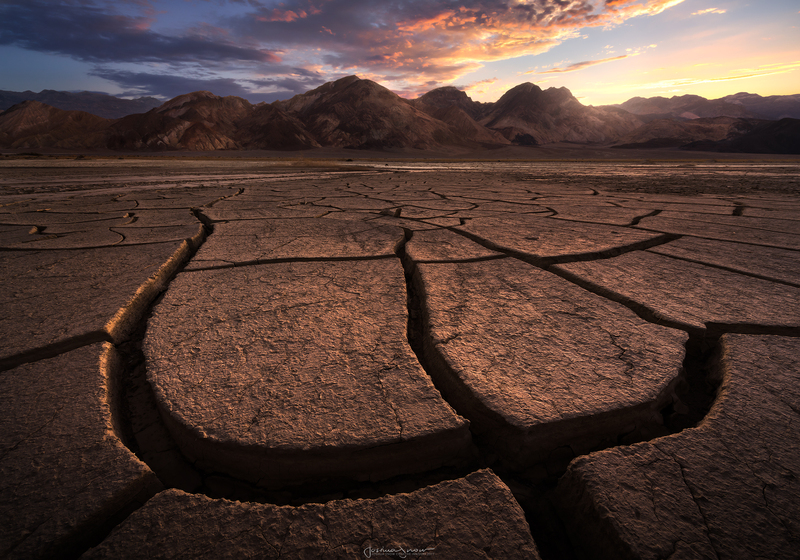 We hiked out on the playa looking across at the distant mountains that seemed to never get closer, soon we realized we had gone too far beyond where the massive cracks are and managed to find them just as the sun was setting. Before it was completely dark I managed to find the awesome crack and dropped a pin on my GPS so that I could find it for sunrise! 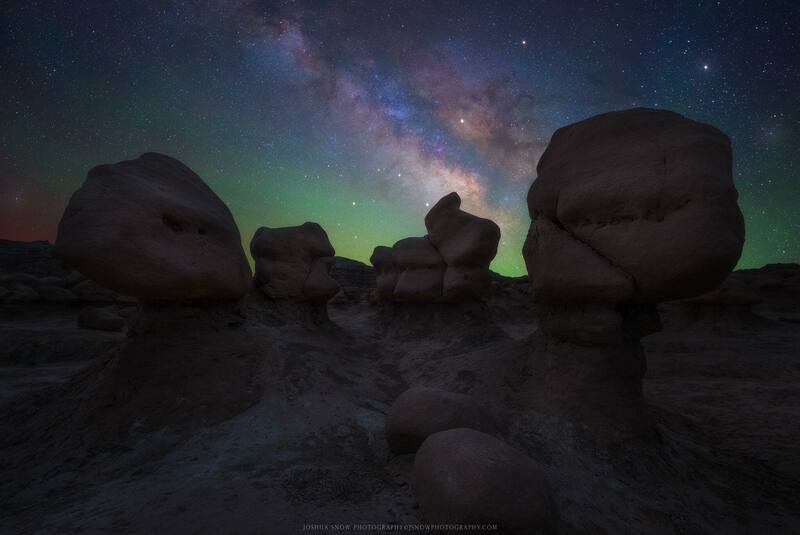 This image was taken while on a long weekend in Escalante with my girlfriend, adventure pup, and great friend Jesse. We Had hiked to reflection Canyon the day before, we were exhausted and sore but didn’t want to just head home so we stuck around GSENM for a few more days and hiked Spooky and peek-a-boo slot canyons the next day and then camped near dance hall rock so we could shoot the milky way over one of these awesome pot holes, and gnarly cottonwoods. While wandering around on this giant rock we stumbled across a crazy aussie looking for the same thing we were! We got to talking and hit it off and continued the search for just the right tree, in just the right hole! We managed to get an LED panel down in the hole, and that was an adventure all in itself! The next morning we went back up for sunrise and I managed to make this image. The colors weren’t very exciting and I almost binned this image but just when I was about to give up I quickly converted it to B&W and saw its potential in a whole new way! What can I say about this image. 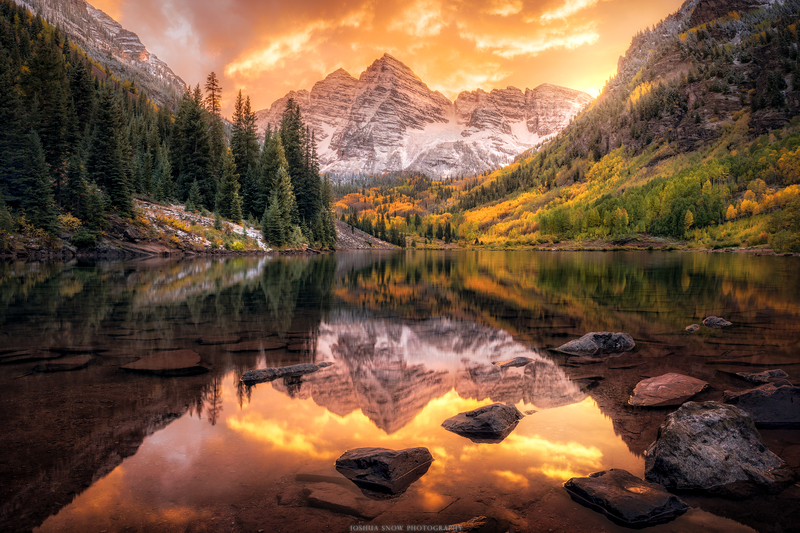 This is Sundial Peak, carved by glaciers high in the Wasatch Mountains outside of Salt lake City. This hike was intense, grueling and extremely challenging. At 10,320ft, a 10.5 mile round trip hike with 4,300ft of elevation gain its by far the most challenging hike I have ever done, especially with nearly 70lbs of gear on my back. Lacey, Myself and the dog geared up in hopes wed find some wildflowers dotting the lake shore, but we were surprised to see that nearly no flowers exist up there at all at least close to the lake because of how trodden the lakeshore is by visitors. We setup camp along the lake, Lacey quickly passed out while I shot away as the Milky Way rose above the peak. I woke early for sunrise and was happy to see some nice clouds forming. Once the sun broke it casted beautiful, warm light on the tips of the peak. 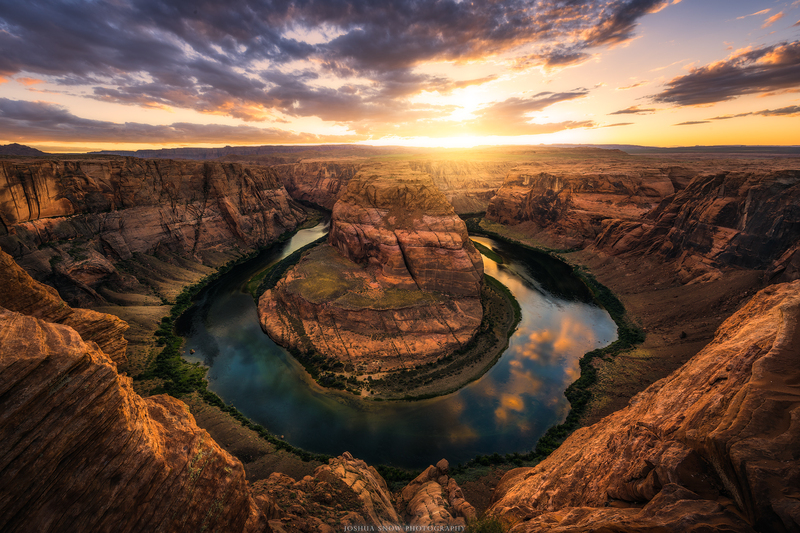 Horseshoe Bend in Page, Arizona is truly a cool place. The view is astonishing but not quite as astonishing as the abundance of people there to watch the sunset. It’s no surprise though! On my very first visit to this famed location I was greeted with one hell of a sunset! I was shocked at the amount of people there, and how little space there was to squeeze in and get a shot. Not being the type of guy that just settles for whatever is easy I found a gap between a couple of other photographers. Not just a spacial gap but a literal massive gap in the rock, so I splayed my insanely tall tripod out across the gap and then summoned my best Jean Claude Van Dam and did a nearly full split across the sandstone. This Gap just so happened to be positioned in the near center of the ben allowing a full view of the entry and exit point of the river in the scene. We ooh’ed and awed as the sun got lower and light got better and better! 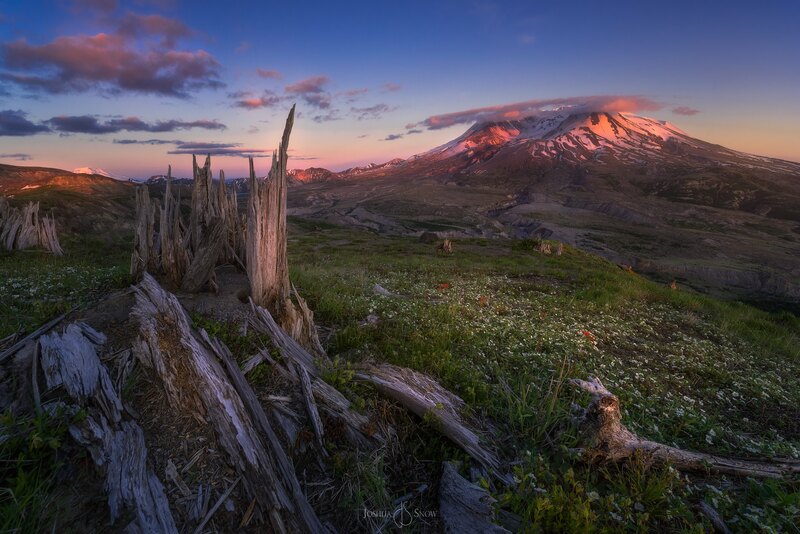 During our 8 day trip to Oregon in June we decided after a few days of shooting the Gorge that we would head north to Mount St. Helens. I mean, how cool is this place! A volcano!?!?! We sat, all by ourselves, 35º in the bleachers of the overlook and watched this beautiful sunset pass through, and a halo of clouds form around the crater. I felt that I wanted to showcase the destruction of the day that the mountain blew its top, and the lush greenery. 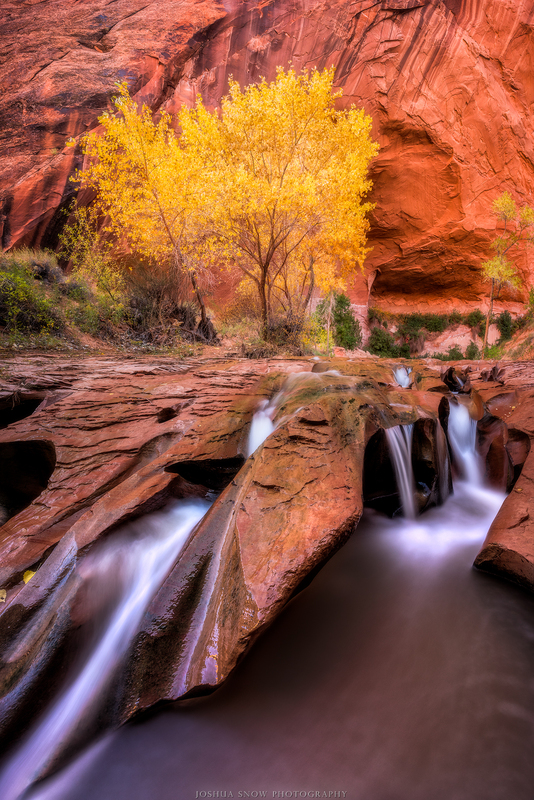 This amazing set of falls have become somewhat Iconic amongst photographers in the southwest and in Utah. 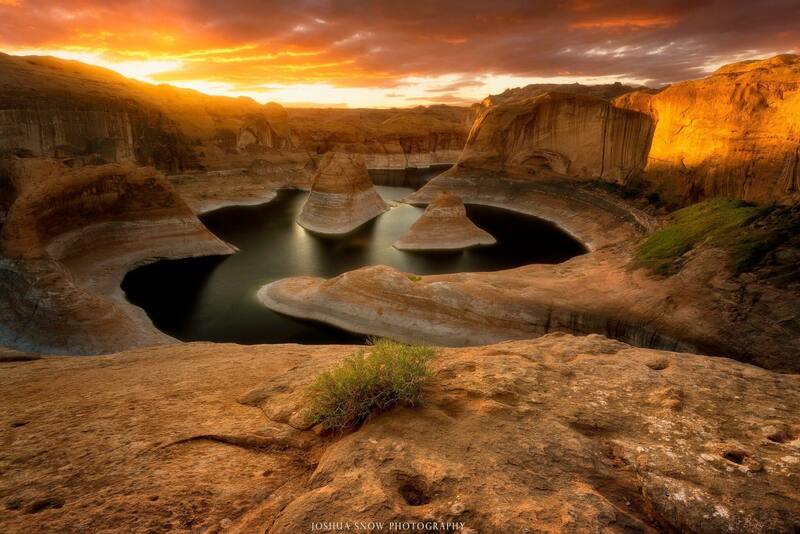 Known loosely as “Swiss Cheese falls”, is as stunning as it is challenging to get to. With a huge and very steep descent into a massive canyon, you wonder how in the world people stumbled across places like this. Once down in the canyon we were greeted by deep yellows and reds adorning all of the trees, vines and foliage in the canyon, and just the right amount of water to make this scene possible! The beautiful Reds of the canyon walls were complimented so well by the yellow cottonwoods. Oh man, this sunset was epic, and I was lucky to be in the right place at the right time! I had been in Aspen for 4 days, camping in the roof top tent and returning to the Bells each morning for just the right conditions. Waking at 4am for 4 days straight was taking its toll and dealing with the crowds here each morning really texted my patience. We had been searching for a grove of Aspens that sloped downward so that we may compose a scene of aspen trunks with the yellow canopy in the background, and hoped for fog. 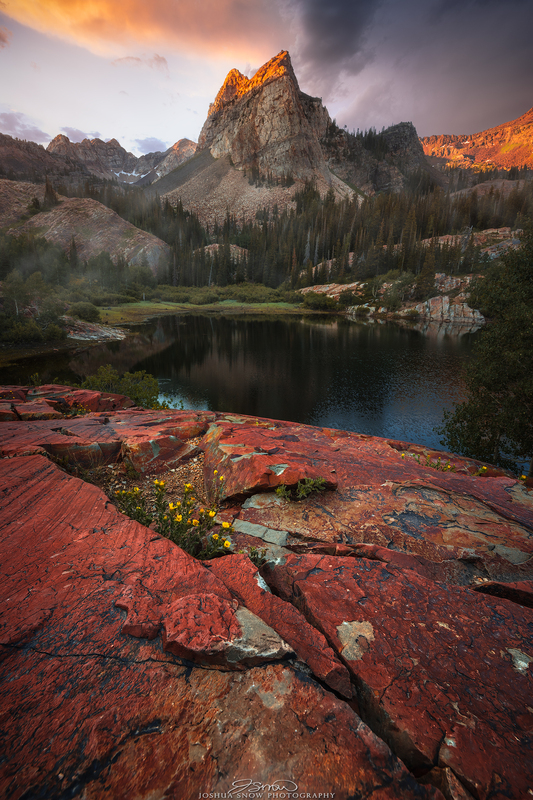 We were on our way to check out a spot above Maroon lake that might tick those boxes but when we showed up before sunset we saw the potential for an incredible sunrise, and it was! 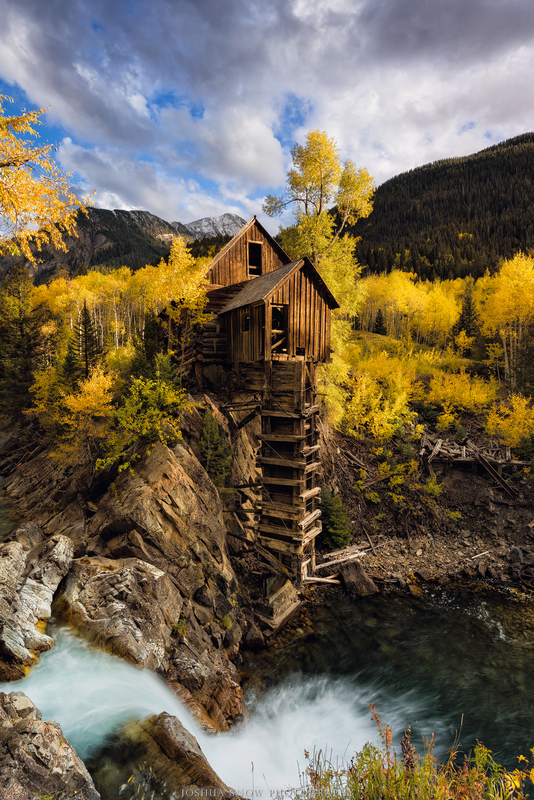 The most photographed location in Colorado, the historical Crystal Mill has been on my list to visit for years. I realized one day that we know live only a few hours from this amazing place so we set out in August to scout, knowing I would return in Fall for the amazing color. I loved the soft directional light just before sunset that dappled across the scene, illuminating the yellows surrounding the old mill. Last night I learned of the passing of my grandfather, a man I grew up loving more than life itself, but life and distance separated us for many years. When we moved here to Moab last year we stayed in Denver for several days visiting with him, my grandmother and aunts. I hadn’t seen him in nearly 15 years and it was as if I was 7 years old again riding in his big pick up heading down to the beach to catch crabs. My heart hurts as I write these words, and I dedicate this image to you grampa, I love you. The Total Solar Eclipse of 2017 was something I will never forget. My friend Jesse called me up just a few weeks before and asked if I wanted to bonsai up to Idaho for it, without any hesitation I said yes! So I booked a flight from Moab to Salt Lake, met up with Jess and we hopped in the rental and drove to Stanley, Idaho. We had talked about even heading up to Jackson, WY or the Wind River Range but we decided to just stay in Stanley! The tiny town was bustling with the anticipation of massive hoards of Eclipse chasers. The roads were lined with taco carts, coffee stands and bbq pits. The campgrounds and bam areas were crammed with people, but we found our little hideaways. We spent time at Stanley Lake capturing the stars, and a sunrise. We knew that with the sun being extremely high in the sky it didn’t really matter much where we watched and photographed it from as it would be extremely challenging to capture with a wide angle given the pinhole distortion. 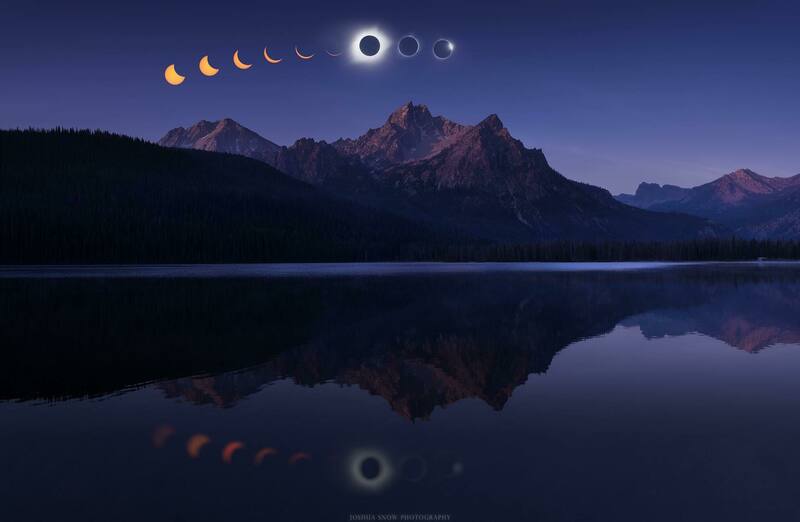 I wanted the eclipse to be the prominent subject in the image, so while we were at Stanley Lake I made this panorama during the twilight hours knowing that I would blend the Eclipse phases into it to reenact as accurately as possibly the mood and feeling of the eclipse. Its important to be honest when making an image that couldn’t have been captured exactly as seen in the image. 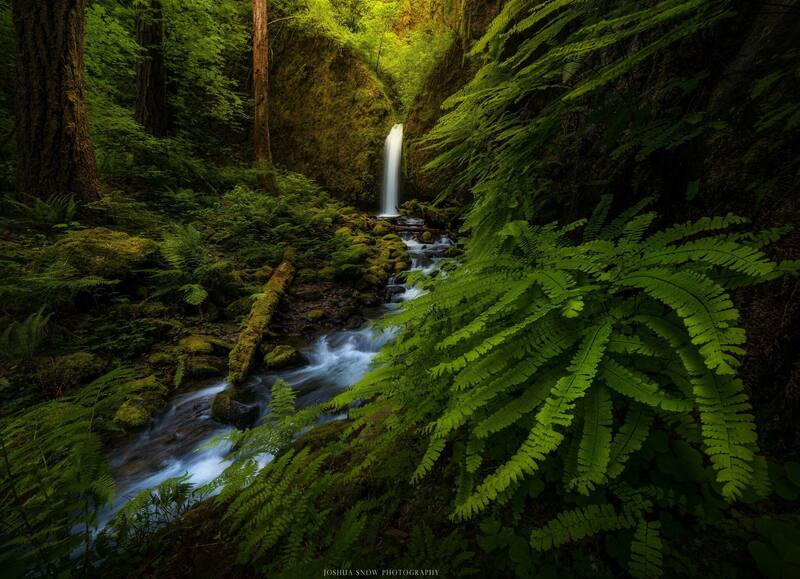 Punch bowl falls cascade along Eagle Creek, above the incredible beautiful Metlako falls. 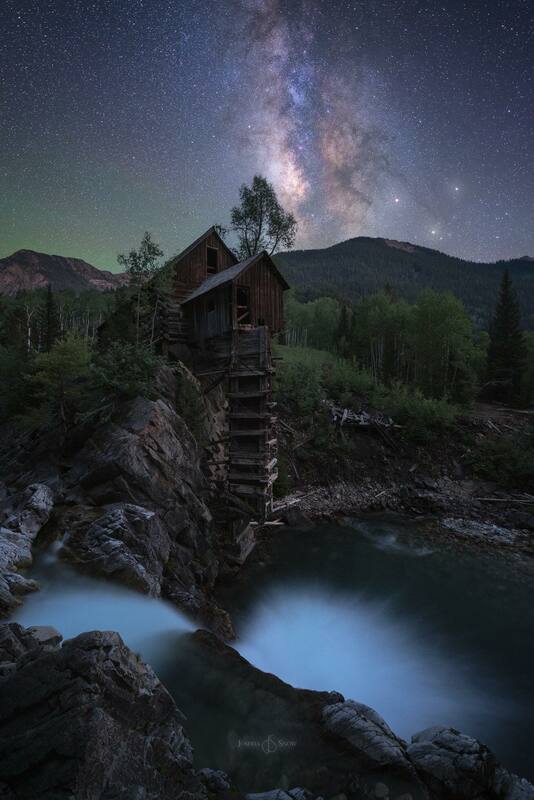 Metlako was a dream to see however a short time ago the “overlook” collapsed into the deep gorge, and a clear view of the falls no longer exists. 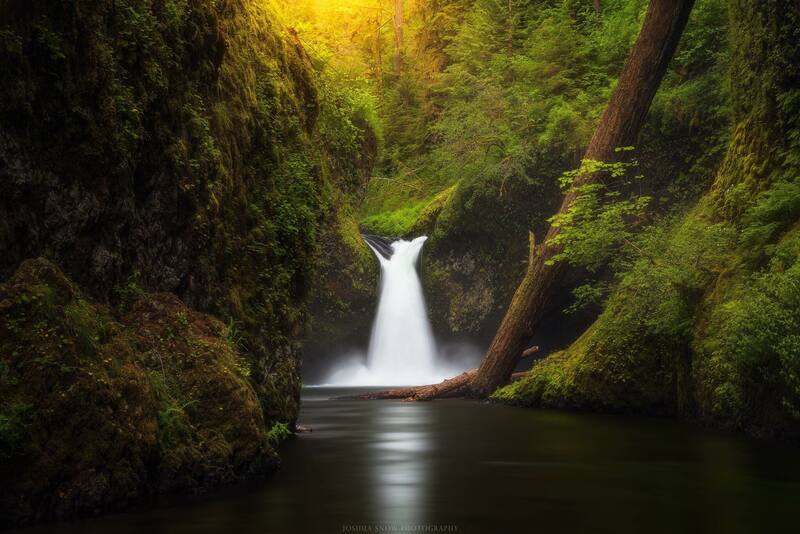 Punch bowl falls were so unique however this fall leaves a bittersweet feeling within me. Just a few seconds after shooting this scene I was wading further across the raging stream for another vantage point when my NiSi Filters 150mm square plate glass polarizer fell from my lens and was swept down stream never to be seen again. The rest of my waterfalls and seascape themed trip was made much more difficult without that unsuspecting piece of glass. 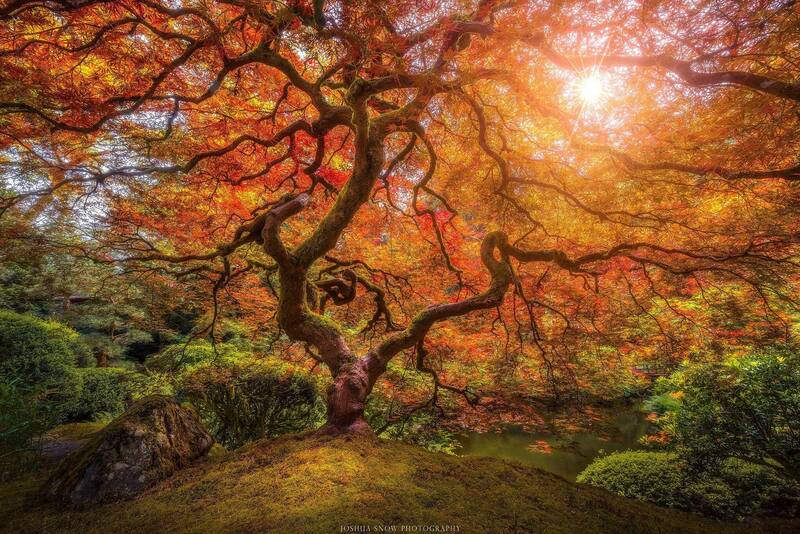 The famous Japanese maple resides in the Portland Oregon Japanese Gardens, and although its imaged often you’d never suspect how small and unassuming this tree is. I only found it because I bent over to tie my shoe and looked to my left! We had wandered around the garden for some time taking in the sights, and smells, I didn’t really think about even photographing the tree but once I saw it, and realized that it was adorning red leaves in June, I just had to! What a place this was! The Mossy Grotto was WAY high on my list of places to visit and at the time of visiting I had only seen one or two images of this place. I really wanted to create my own vision of this place. There a funny (now) story with this one, however. I didn’t know much about the hike, so I told my girlfriend it was an easy/moderate hike…well its not ha! It seemed like never ending switchbacks climbing hundreds of feet, a steep decent down loose rocks where rock slides had clearly happened in the past. After several days of car camping and non stop hiking she was a little irritable so the hike quickly ticked her off. We argued the whole way, and half way down the rock slide area she just sat down and pouted while I continued on. At the time I was fuming, I was upset that it mattered, I was clouded by anger and frustration so I was shocked that I walked away from that area with any usable images let alone one of my all time favorites! What an intro to Navajo Sandstone slot canyons this was! 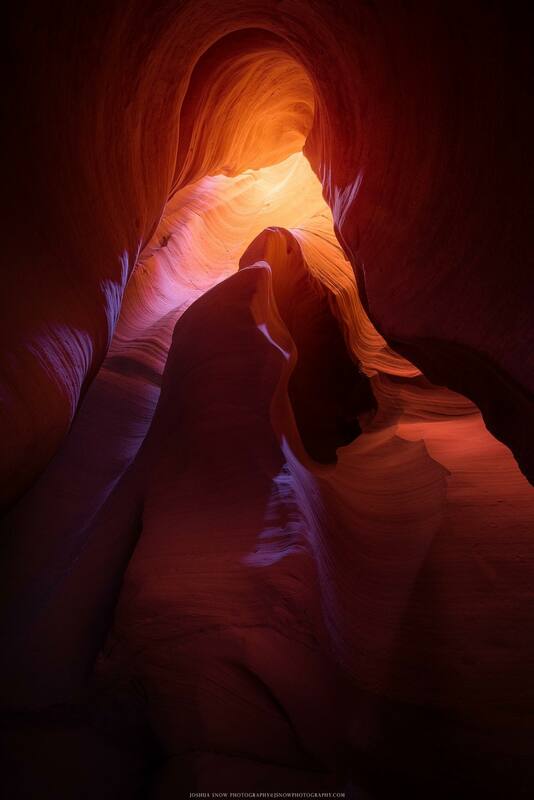 On a trip to Arizona we really wanted to visit one of the many slot canyons in the area but didn’t want the crowds at Antelope although I am dying to see that canyon for myself someday! This Canyon was short but sweet, the colors were outstanding, and the private acoustic guitar concert really helped me hone in on my creativity! Its funny, at the time of visiting this place I had seen exactly ZERO images, and only heard about the canyon just before the trip. I got home a day later and immediately process this and another image and posted it, then received a comment on social media that another photographer had taken an image of almost the same composition but hadn’t yet posted it, and another comment saying someone else had just posted the same composition that day. Its crazy that several photographers can visit a place and without any influence at all come away with an image of the same scene. Pretty awesome! Goblin Valley State Park, near Green River, UT reminds me of the movie “The Labyrinth” Starring the late David Bowie, and the trolls depicted in the movie remind me of the hoodoos that fill this valley. I have been here many times but never really had much desire to capture an image, until this trip. I stumbled around for hours looking for a composition before stumbling on these 4 trolls, and when I saw them I felt like a little kid about to be bullied on the playground, they felt like 4 big, dominant figures in the night. The view from a steep ledge along Lake Powell, the morning after we made the grueling near 10 mile hike to this spot outside of Escalante. Another awesome trip to GSENM with Lacey, the wonder pup, and good buddy Jesse! About 2 miles from our destination we came across a massive water hole in the slick rock that coolant have come at a better time, as I had jut taken the last sip of water in my second 3 liter reservoir. So we stopped, filtered water and even swam for a bit to cool off! It felt great to get the boots off and relax for a bit. Just after sunrise we broke camp and headed out, I could not wait to get back to the car and town for a giant, ice cold diet pepsi! 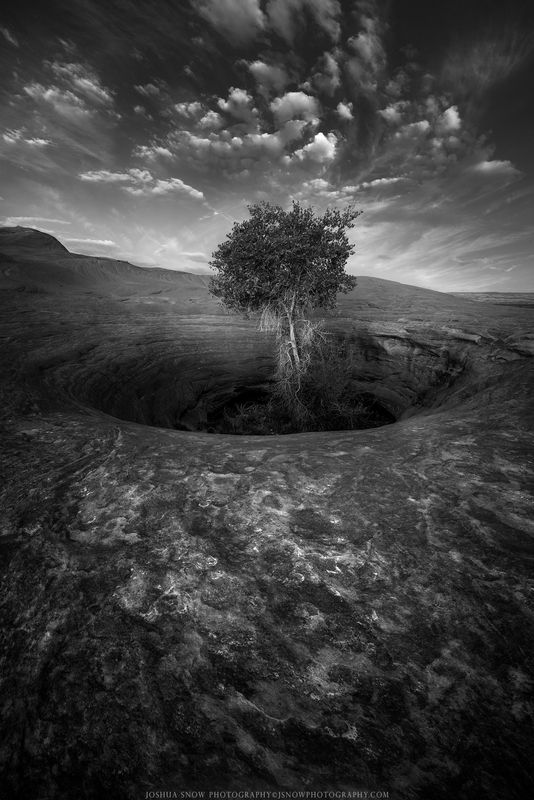 Deathly Shadow, a glimpse of predawn light among the Utah badlands. A place I’ve visited dozens of times and always can’t wait to go back. On this morning I met up with a couple of really inspiring photographers visiting from Oregon on a tour of the southwest. 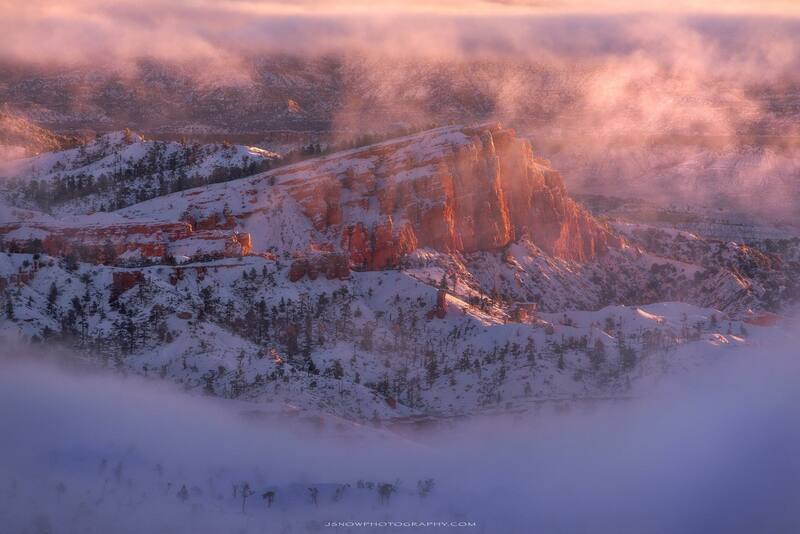 The “Sinking Ship” of Bryce Canyon National Park. On my third visit to Bryce, my good buddy Derek and I met up with Dave Swindler of Kanab. The conditions were pretty mazing as we had pockets of dense fog and a break in the clouds allowing some soft sunlight to enter the canyon and highlight the hoodoos and formations. We ran around for over an hour snapping away like tourists! 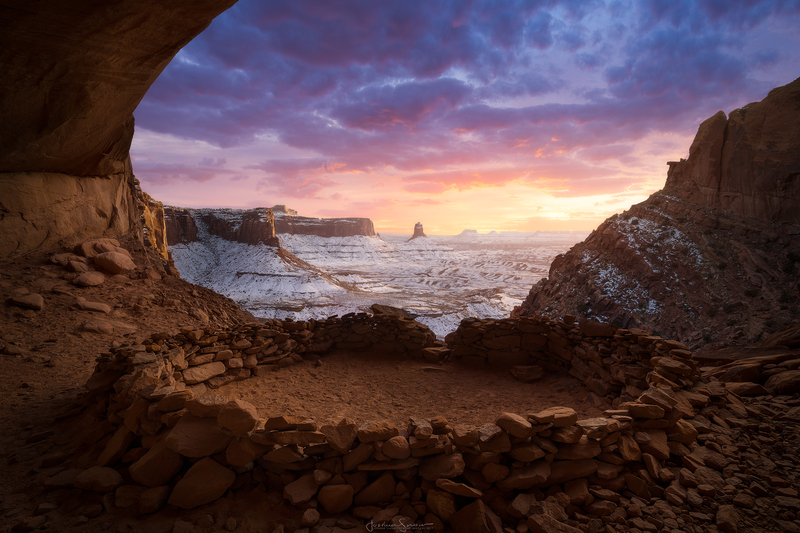 Ive visited this amazing, spiritual place many times since living here in Moab, and each time its equally special. Moab received a massive snow storm just a couple of days before Christmas, but unfortunately I couldn’t make it out to shoot during the storm. A couple of days later I had a sunset free and Lacey and I headed out to this place hoping that the canyon and canyon walls would still be clinging to some snow. We were graced by an incredible sunset to close out the year! 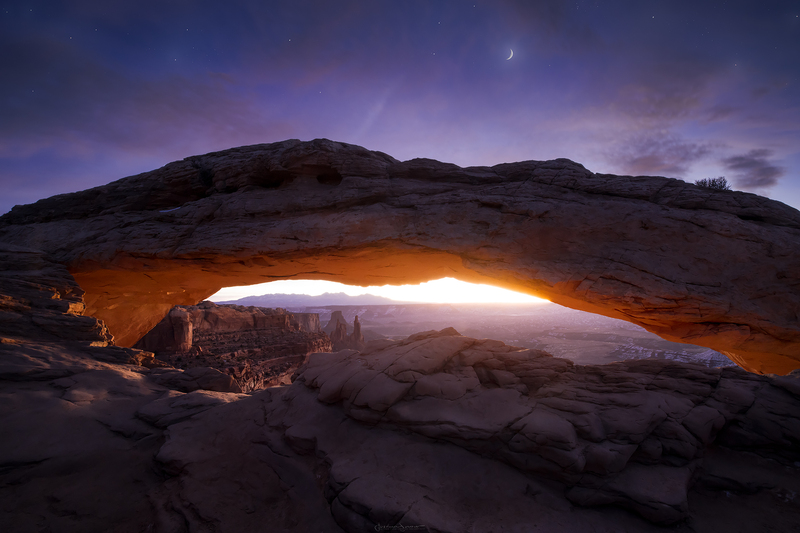 Mesa Arch has been photographed an estimated 1 million times….and that was a completely made up fact, but its been shot 19 ways to Sunday so I really wanted to make something unique here. Ive captured the iconic sunstar, with pretty clouds and I love the image, but this, this image really made me smile to capture and create. Most of the snow had melted off by the time I was able to get out and photograph it but the clouds were perfect, the intense glow from the sun just below the horizon was really special. Happy New Years All! Thank you so much to all of you that have followed my work, my journey and my passion. Those of you that have purchased prints, or taken a workshop, and those of you that have become my friends! I hope you all enjoy this collection of my favorite images of 2017!